The Ukrainian IT industry has been growing actively over the past year. In fact, the size of the industry, as well as the public attention that it gets, is pushing many of its members toward greater transparency and compliance with various regulations both in Ukraine and globally. Outsourcing companies have generated a steady flow of work related to acquiring companies, teams and even individual developers, along with some contractual work on MSAs, SOWs, NDAs, etc. Now some Ukrainian companies are switching to product development and there is increased demand for product protection and clearance on the most important markets, namely the US and Europe. Many innovative products and services entered the Ukrainian market in 2016-2017 from abroad. Some with big fuss and publicity, but many simply extended their services to Ukraine without much public attention. One company though, an important industry online payment intermediary, is still resisting the call. We can only hope they will change their mind soon. Entry to the Ukrainian market for many online services and digital products is relatively easy as the relevant areas enjoy little or no regulation. But some areas such as telecommunications and financial services are heavily regulated and could be problematic. Next year IT companies should watch out for the creation of a specialized IP court to ease copyright and patent enforcement; introduction of cyber security regulations to deal with neighbouring state cyber-attacks; and increasing the need to comply with GDPR requirements to continue processing European personal data. Telecom companies have usually had strong internal teams of lawyers, with work only being outsourced to law firms on large-scale litigations or on acquisitions of telecom assets. Regulatory work (and other routine legal tasks) were, therefore, dealt with by in-house telecom legal teams. Last year, partly due to redundancies in internal telecom operators and partly due to the scale and complexity of the projects that telecom operators faced, we saw some significant projects outsourced to law firms, especially in the area of the transformation of their operational models and transferring certain functions to global service centers. We also saw certain routine functions, such as the preparation of regular reporting, also being delegated to outside law firms. Over the last year numerous attempts made to change the legislative landscape in the telecom sector have been unsuccessful, with only the draft law on access to infrastructure finding its way into law. The principal draft law on electronic communications has not even been considered by Parliament yet. Although the need for change in this area has become obvious to all, many nuances contemplated in this draft law, such as the level of state involvement in market regulation, are rather controversial and need further balancing. Yet, the further liberalization of licensing requirements combined with more stringent obligations on market players (especially on data security and public safety) will certainly become part of future legislation, if not next year then shortly afterwards. Sayenko Kharenko has a recognized extensive team advising high-profile technology companies, and provides IT advice to corporate clients and the largest IT outsourcing and product companies, IT start-ups on software development matters, mobile applications and gaming. In addition to the traditional transactional presence, the firm’s recent remit has included comprehensive IP due diligence, investments, corporate and tax structuring; various regulatory issues, including data protection and cloud computing matters; sophisticated commercial agreements and tax incentives. The firm is sought for its capabilities in cross-border technology-based transactions, including M&A. In particular, the firm advised Shanghai Giant Network Technology Co. on the Ukrainian aspects of the USD 4.4 billion acquisition of Playtika Ltd. Other highlights included acting as legal counsel to U&Sluno a.s. on recovery of penalties and damages in Ukrainian courts, caused by counteragents in violation of the terms of general cooperation agreements; advising Unirad LLC on distribution of the TRACAB tracking system in the CIS region. The firm has a prominent presence in the telecommunications sector, representing multinational telecom, media and TV broadcasting companies across sector specific regulation, IP, tax, corporate and competition matters. The antitrust team is the premier choice for high-value transactions involving industry heavyweights. The lead partners are Nazar Chernyavsky (sector specific expertise and rainmaker for telecom clients) and Oleksandr Padalka (extensive IP practice). Mykyta Polatayko, IT group coordinator, is described as an open-minded expert and appreciated by the market for his expertise in IT law, tax and contracts. The IP/IT work is coordinated by senior associate Oleg Klymchuk. 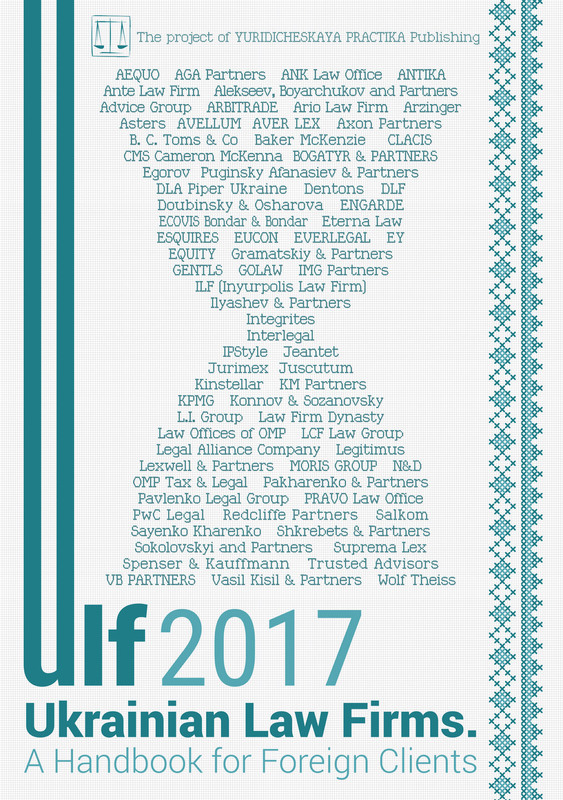 ILF (Inyurpolis Law Firm) has a fast growing IT practice and maintains strong relationships with outsourcing and product IT companies from Ukraine, the USA, EU and Australia. In 2016 a huge bulk of work was focused on corporate structuring with further opening of foreign companies in different jurisdictions, support for US IT players entering the Ukrainian market, restructuring of IT outsourcing companies and establishment of R&D centers. The team is supported by a group of tax practitioners to perform seamless international tax solutions. It is worth noting that the ILF team has formidable strength in software development contracts and IT outsourcing. One recent highlight of the firm was supporting establishment of a Ukraine-based R&D laboratory for US software company iPiccy; advice to InsArt, one of the leading IT outsourcing companies in Eastern Ukraine, regarding a software development agreement with a US company. One landmark project of late was representing one of the TOP 25 banks in Ukraine on its agreement with IBM, to outsource IT infrastructure servicing as well as development and support of proprietary software. The client list includes Qualium Systems, SciForce, KnubiSoft, Velton, iPiccy, Echostar Ukraine, InsArt, Provectus, SPS Commerce. Artem Naumov, partner, is getting more involved in the IT sector. Anton Zinchuk, partner, is admired for his strong complete expertise in both IP, tax and corporate law. Given extensive experience in the technology and telecom sector throughout the region, CMS Cameron McKenna is hired to give advice on both domestic and cross-border matters. The Kyiv team is instructed by international players for IP structuring and regulatory work, specific employment, data protection, commercial matters, with notable experience in such specific areas as cloud technologies and social media. Its strong transactional capabilities empower the office to act on M&A deals in the sector. Amongst publishable transactional mandates is advising Horizon Capital on the sale of Ciklum, a leading global software engineering and solutions company to George Soros’s Ukrainian Redevelopment Fund. Highly sophisticated projects for telecom providers are a feature of the recent workload. Olga Belyakova and Volodymyr Kolvakh are the core practitioners. DLA Piper provides extensive expertise in telecom and IT sectors, showcasing booming instructions from technology heavyweights. The wide-ranging work across IT, media and telecommunications spans over corporate and finance, intellectual property, domestic and international employment and compensation plan matters, infrastructure services and facilities development, tax, regulatory compliance, litigation. This robust practice has notable strength in data protection matters, software development and licensing, telecom licenses in Ukraine, and is especially often hired to handle cross-border projects. Among the latest multijurisdictional projects is providing legal support to Impulse Ventures LLC, where the firm acted for the lead investors on fundraising into an English technology company called LoopMe Ltd, which has subsidiaries in Ukraine and the US state of Delaware. The office also advised on Ukrainian law issues (corporate, employment, regulatory and real estate) within multijurisdictional project in which DLA Piper acted for CEB Inc. within acquisition of Maven Research Inc. The firm’s client list includes solid names, with Vocera Communications, Inc., Payoneer, CEB, being publishable to note. Natalia Pakhomovska, partner and head of IPT, added a number of strategic telecom projects to her profile. Axon Partners is a new boutique team established in March 2016 that has already gained market praise for its unconventional approach and the personal visibility of its core individuals. The dynamic team extended its capacity in Kyiv, and launched an office in Lviv. The sharp IT focus encompasses contract law, IP, litigation, corporate law, domestic and international tax, and showcases projects in different IT areas like e-commerce, IT outsourcing and R&D offices, IT integrators, product companies, fintech, startups and VCs. The firm completed a complex project, having represented one of the investors in a hardware startup with an R&D office in Ukraine and headquarters in the US. Moreover, the firm advises Invisible CRM, one of the biggest and the oldest Ukrainian IT companies, on privacy shield issues in the US; assists Poster POS, an application for restaurants with R&D office and operations in Ukraine, with tax and legal aspects of expansion in the Russian Federation. Some other selected clients are BlaBlaCar, Innovecs, Stanfy, TripMyDream, Hosting Ukraine, Kuna Bitcoin Agency, DOU, rabota.ua, Wishround, Vitagramma, ProZorro, Clickky, Rialto, Vertamedia, ISM e-Company, Visco, Ecoisme, Yalantis, Myhelix. On the telecom front, the firm acted as a legal advisor to VDNG-TECh, the first corporate startup accelerator built by Kyivstar, drafting service contract and NDA. Dima Gadomsky, CEO, is among the top-recognized experts renowned for deep understanding of the IT business and efforts to try the latest ideas. The team of other partners, namely Denys Beregovyi, Nazar Polyvka, Bogdan Duchak, has been extremely active since the firm’s launch. The key figures in Lviv are Yuriy Kornaga (taxation) and Orest Gavrylyak (international tax). AEQUO enjoys a remarkable client following from technology, telecom companies and media majors, spreading its offering throughout transactional work, regulatory and litigation. Notably, the firm is present in every segment of this industry, dealing with cable, satellite and telecoms media, representing clients in M&A, corporate, competition, IP matters. AEQUO advises Viasat World Limited, a leading international TV company, on the acquisition of Viasat Ukraine LLC from Modern Times Group. Another notable mandate is advising on acquisition of 3Mob company — the telecom company is the holder of the first 3G license issued in Ukraine. In the media area the firm represented Forbes Media on a number of issues related to its American Arbitration Association arbitration proceedings against United Media Holding N.V., Forbes’ former licensee in Ukraine, in the termination of its license agreement. The co-heads of TMT is corporate and M&A partner Anna Babych, and IP partner Oleksandr Mamunya. The client following of Arzinger covers foreign product and outsourcing companies, IT corporations, e-commerce, media, as well as the First Television Channel in Ukraine for the IT-industry. The area of queries included establishing effective corporate structures given the applicable tax burden, drafting of contractual background, protecting IP rights issues related to software, considering its peculiarities of IP rights assignment. Given its exceptionally strong standing in life science, the team supported a leading US medical technology company with software as a key non-material asset, on agreements regulating the terms of software creation and further IP rights assignment, subcontractors qualifications as well as procedures on software modification. Olga Baranova, counsel, and Pavlo Khodakovsky, partner, are lead practitioners. Kateryna Oliinyk, head of IP, has been endorsed for her deep knowledge of domain name disputes. National heavyweight Asters is attracted for contractual support and structuring of software development projects, IT-related audits, data protection, specific IP matters, evolving domain names and anti-cybersquatting, IP rights transfer. Other recent queries touched on cross-border tax structuring, employment, corporate, commercial framework and infrastructure. The firm traditionally attracts praise for its advising a prestigious roster of telecommunication clients. The expertise encompasses, inter alia, issues regarding network interconnection, access, licensing, project finance, loan facilities for mobile operators and fixed telephony operators, as well as regulatory for satellite service capacities. The client roster includes Tyco Electronics, The Foundry Visionmongers Limited, Motorola Solutions. Managing partner Oleksiy Didkovskiy is known for his legacy in the telecom area. Julia Semeniy, IP partner, is in charge of handling sophisticated queries from sectoral clients in this area. The global presence of Baker McKenzie makes it the port of choice for international operators of software development companies, satellite communication systems, major international telecommunications companies, communications hardware providers and wire and mobile telephone communications operators. Most recently the IT and telecommunications practice group has advised on compliance with domestic and international laws, licensing and the regulatory process, system integration, contractual matters, IP protection, investment and finance, employment, tax and customs. Viacheslav Yakymchuk, corporate/M&A partner, heads this dedicated group. His team acted for Horizon, a US private equity fund, on increasing its stake in Datagroup as part of the debt restructuring of Datagroup owed to VTB Ukraine. The strong IP practice, as led by Ruslan Drobyazko, represents technology majors on trademark protection, counterfeiting and enforcement. Oleksiy Stolyarenko is seen in practice development. Juscutum Attorneys Association maintains good standing in the IT sector, and reaffirmed its niche telecom service with the admission of new junior partner Yuriy Kotlyarov (previously — head of the Legal Department at Ukrtelecom). The IT practice preserves a following from clients seeking corporate structuring and attracting investments. The team recently acted for Creative Quarter in the establishment of an accelerator and the attraction of a strategic investor; supported Smarty Sale in the organization of an Internet service. Managing partner Artem Afian is the head of IT. This past year the team was completed with a number of highly-focused practitioners, Valeria Dyachenko (GR in IT) and Nestor Dubnevych (cryptotechnologies). The cross-practice TMT of Vasil Kisil & Partners has acquired increasing importance in recent years. The experience covers transactional and regulatory matters with respect to industry specifics, as well as intellectual property, labor and employment, dispute resolution. The firm advised a Ukrainian subsidiary of an international IT manufacturer as the choice of an operational structure for doing business in Ukraine, including tax structuring of its relations with contractors, VAT and corporate income taxation of its operations, execution of employment and service agreements with individual entrepreneurs. The team acted as a local counsel in advising Modern Times Group MTG AB, a Swedish media holding, on the sale of its Ukrainian pay-TV channel business subsidiary Viasat Ukraine, LLC to Viasat World Limited. Contractual work for IT developers, IP disputes, tax disputes and criminal cases are all part of the team’s recent caseload. The team encompasses Vladyslav Podolyak, counsel, IP; Oksana Voynarovska — labor and employment, partner; Andriy Stelmashchuk, managing partner — dispute resolution. Volodymyr Igonin, counsel, leads projects in telecommunications and media. Ilyashev & Partners is renowned for its litigation capabilities acting for major TV channels. The team represented the Inter TV Channel in a breach of contract dispute on the supply of satellite capacity by SpaceCom, an Israeli operator of satellite broadcasting. Other clients are represented in a range of commercial litigation, inter alia, debt collection and administrative appeals. Some notable clientele includes Ciklum, Datagroup, Sitroniсs Telecom Solutions, Horse Place Ltd. Managing partner Milkhail Ilyashev oversees the firm’s projects. Dentons has a global presence in the TMT sector, advising a roster of international and domestic players. In the public area is advising BIIR on various corporate, IT and regulatory issues related to the company’s commercial activity in Ukraine. The office is traditionally busy with the instructions of telecommunication sector providers, being mandated for specific regulatory assignments, as well as corporate, finance, employment and currency control regulation. The spectrum of TMT clients is serviced by four partners, namely Oleg Batyuk, Markian Silecky, Adam Mycyk, Natalia Selyakova. Given strong M&A capabilities, AVELLUM is often preferred for transactional work in complex regulatory frameworks and handles comprehensive due diligence of acquisition companies, covering specific issues of employment, IP rights protection and compliance. The firm advised Altran, a global leader in innovation and high-tech engineering consulting, on the acquisition of Lohika, a software engineering services firm on the due diligence of IP and employment matters; advised Onex Corporation, one of the oldest and most successful private equity firms and Baring Private Equity Asia, on employment matters in connection with the acquisition of Thomson Reuters’ Intellectual Property & Science Business. Mykola Stetsenko is a lead partner. Yuriy Zaremba, associate, is active in giving employment advice. Eterna Law advises range of IT companies, startups and IT investors on IP, tax and corporate mattes. The firm advised WEFUTURE Ltd on registration of international trademark in UK, Australia, EU, India, Russia, Ukraine, USA, exclusive property copyrights on computer programs; advised Alexander Chernyak, a co-founder of the Russian used cars broker CarPrice, on his investment in a Brazilian counterpart service Instacarro. In addition, the firm regularly acts for well-known telecom companies, providing them support in disputes, on IP and corporate mattes. For instance, the firm advises STB Channel on trademark registration and copyrights. The IP expert Ilarion Tomarov1 is a bright lawyer according to the peers’ survey, being appreciated for promoting IP ideas within the IT industry. Oleh Malskyy, partner, is in charge of corporate and M&A work. IP Law Agency Synergy is known for its niche service, focusing on IP litigation, tax, and commercial contracts. The firm completed the case of trademark violations on the Internet, sites and domain names representing the Internet shop Rozetka.ua. The agency also advises producers of computer games on contractual issues and establishment and transfer of rights on mobile application GO ECO NETWORK. The team often advises entertainment and movie production clients. Recent work also included giving copyright transfer advice to the Atom Film Studio, and taxation of royalty for the organizer of film festivals. Partners Viktoriia Ostapchuk (tax) and Anna Kravchuk (domain name disputes) are the main contacts. Spenser & Kauffmann launched its IT practice in May 2016 with the arrival of new counsel Tatiana Kharebava, who became head of IP, IT and antitrust. The practice covered instructions of existing clients and won new ones. In 2016 the team advised several IT start-ups on IP protection including elaboration of different agreements for the transfer and commercialization of IP rights. Another highlight is support to a leading search engine company in launching an online taxi project in Ukraine. The team advised one of the biggest banks on its negotiating position regarding IT-outsourcing agreement with IBM. The dedicated industry of Gramatskiy & Partners accumulates experience of commercial, tax, employment, IP and business protection practitioners. Apart from industry specific assignments, the firm is enlisted for structuring holding companies, finance of Internet advents, tax and labor relationship structuring, legal support in the course of searches and seizures. On the transactional front the firm completed a number of projects representing foreign investors in the course of the buying out of Ukrainian IT companies, technology transfer, development of IT projects, acquisitions of software produced by local developers. The client list includes Playtech Software Limited, Clickmein, SKYWIND Tech UA, PTS UA Services, Sea Services Ukraine, KSTT Services. Igor Reutov oversees industry workflow. In 2016 Wolf Theiss sustained its IP/IT practice diversity that was developed in previous years. Olena Vardamatska, head of the IT practice, conducted and supervised due diligences of IT aspects in Ukraine as part of huge multinational M&A transactions (e-commerce as well as B2B producers), and also consulted clients on diverse e-commerce aspects, and provided legal support for investment in a Ukrainian e-commerce start-up. The Ukrainian IP boutique IPStyle advises IT companies and private entities on the development and use of IT products as well as during transactions. The scope of recent work includes patenting in IT sphere, copyright registration, and development of license and assignment agreements, protection strategies. Mariya Ortynska is primarily known for IP work and is the main rainmaker at the firm. GOLAW puts a great effort on boosting its presence in the IT sector. In this past year the firm advised Ubisoft Ukraine LLC on corporate, commercial and employment matters; represented Vortex Group on various aspects of corporate law, contractual relations, and litigation. The firm is attractive for proficient tax litigation capacities. Thus, Absolut Trading, a distributor of telecommunication services, was represented in a tax dispute. Managing partner Valentyn Gvozdiy is the main point of contact. Lviv-based counsel Advice Group is actively involved in advisory of predominantly foreign clients in Western Ukraine. In 2016 the team performed legal support for the international IT company Symphony Solutions, especially advised on contractual relations, personal data issues, intellectual property, corporate and operational activity. Other selected clients include Conscensia, Ericpol, Echovox. The projects are supervised by managing partner Anton Podilchak. Gryphon Legal, domestic practice focuses on advising banks and financial companies on a bulk of regulatory matters. In 2016 the firm has been highly active in currency exchange, money transfers and payment services projects, and advised on IT issues, inter alia, support of program proceedings and implementation of processing in financial companies, joining payment systems, crypto currencies and other IT aspects of money transfer. Helen Lynnyk and Igor Lynnyk are the main contacts. The IT practice at Sokolovkyi & Partners is focused on tax advice to IT companies and individual entrepreneurs, M&A, termination, support in criminal proceedings and legal due diligence. In a recent highlight the firm supported acquisition of IT products, software development agreement, SaaS (software as a service) advice, implementation of IT and software. Notably, the IP practice covers protection of IP rights throughout an IT project. Ihor Shevchenko, counsel, is in charge of the practice. Taras Kyslyy, counsel and head of the IP and TMT practice of Egorov Puginsky Afanasiev & Partners Ukraine, has actively practiced as a compliance adviser for IT companies, according to the reviews of peers. Dmytro Ovcharenko, SBT Systems, receives constant reference on advising large IT companies and is involved in the activities of sectoral associations. Yuriy Krainiak, partner of Jurimex Law Firm, is highlighted for his great contribution to legislation amendments regarding the take down notice procedure. Oksana Kobzar, founding partner of the Kharkiv-based Oksana Kobzar Law Office, is appreciated for her IT-dedicated tax advisory work.